Notes: "Wm. 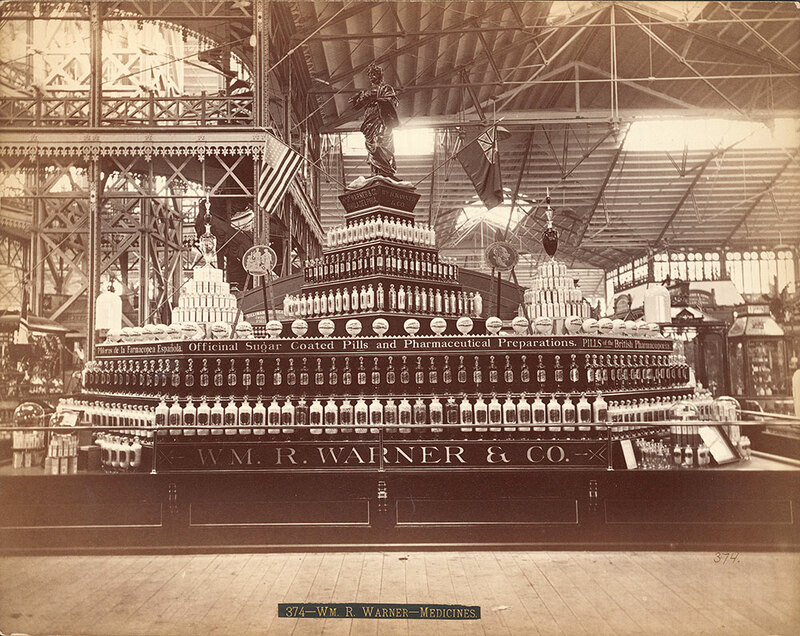 R. Warner & Co., Philadelphia. Pildoras de le Farmacopea Espanola officinal sugar coated pills and pharmaceutical preparations. Pills of the British Pharmacopocia." --Display signs. Notes: Exhibit title: Warner, Wm. R., & Co., Philadelphia, Pa., Exhibit #7, Main Building, Bldg. #1. Notes: The five-tiered hexagonal exhibit stocked with pharmaceutical preparations and decorated with two pictures on stands midway up and a sculpture and two flags (one American) on top of the display. Other displays visible in the background. Notes: Title on photo label: Wm. R. Warner -- Medicines.